There was no shortage of plot developments in this episode, but a week after we see TK flipping out and punching Ken, it feels like it's missing the same kind of emotional crescendo. The clever stuff is inconsequential, the plot twists are at times both predictable and underplayed, the emotional stuff is borderline idiocy and the ultimate payoff is a pretty shameless plot device. With Kimeramon burninating the countryside and the base floating along behind him like the Goodyear blimp, the team knows they need to do something about it. Izzy comes up with the most elegant solution while simultaneously demonstrating his concern for the Digital World ecosystem- create an oil spill. Tentomon, Agumon and Gabumon do the dirty work, releasing the bubblin' crude and setting it ablaze as the base floats by, sending it crashing to the ground in a fiery heap. This lets the digidestined use the backdoor entrance again, still unsecured and now with a convenient ramp for Raidramon to land on. They ride their trusty steeds in, swat away some Bakemon and end up face to face with Kimeramon himself. This ultimate battle between the manufactured monstrosity and all five Armor levels... is repetitive and one-sided, mostly consisting of the Armors getting thrown around repeatedly by indirect hits, eventually devolving into their In-Training forms... and Patamon and Gatomon who apparently cannot fall to In-Training under any circumstance. Ken's already hearing voices and growing more and more manic, but these In-Training forms bother Ken extensively. He recognizes them from the soccer game and seems completely bewildered by the fact that they're here. Wormmon explains that they're just like human babies, with bothers Ken even more. As important a note as this is, it's also strange, as he saw Patamon (who was also at that soccer game) just last episode and didn't react. TK must have given him a concussion or something. Either way, it leads to him halting Kimeramon's attack... for some inexplicable reason. 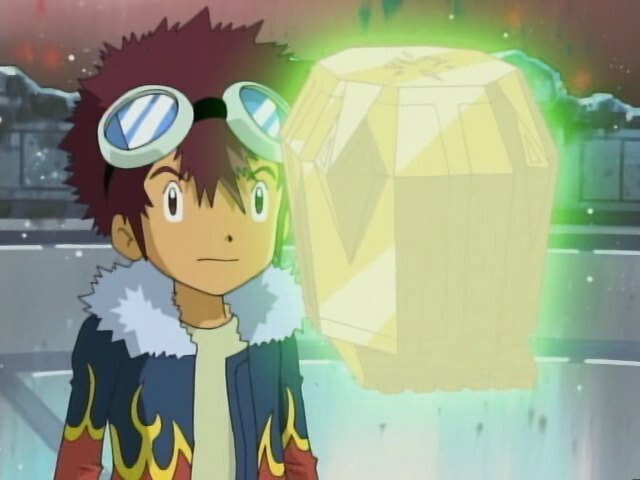 The digidestined are able to gather up their Digimon and plot a retreat... except Davis doesn't want to retreat, adamantly determined to see this plan through no matter how weakened they are. The others end up sticking around, but only out of fear that he'll somehow succeed and get the credit for it. Good teamwork there. It's one thing to show determination and grit when your back's against the wall. But they've already infiltrated the base twice and there's no reason to think they won't get another chance, possibly while Kimeramon is off terrorizing the peasants again. While we're supposed to admire Davis's resolve, pushing ahead while in such a weakened state endangers him and his entire team. He's saved only by a series of lucky breaks. First Kimeramon stops listening to Ken and flies off. The dark powers laugh at Ken, driving him further into the brink of madness. This leads to Wormmon's big Judas moment... which should have been a lot more dramatic than it actually was. He just shows up, tells Davis he needs to put an end to this to restore Ken's sanity, then leads him to a place that he was probably going to find on his own. There's no extensive build up, no angst as he wrestles with his conscience, and not a single scene where he's chased by tanks. Naturally, Davis just happens to discover that the base just happens to be powered by a digiegg that just happens to respond to Davis and turns Demiveemon into a healthy Magnamon, who just happens to be strong enough to turn things around. That's mighty convenient. TK's still coming down off his badass mode, uncharacteristically saying “I” have to find a way to stop Kimeramon. Kari quickly jumps in using “we” and “us” a lot. Why weren't the Bakemon rescued along with all the other prisoners? They're all ringed up too, so it's not like they're doing this voluntarily. Is there some sort of contract stipulation preventing Gatomon from going to her Rookie or In-Training form. Nefertimon took just as much abuse as the others, but devolves to Champion... if you can even call that devolving. Salamon and Nyaromon are adorable and we should see more of them. For this shock evolution to Magnamon, there's not a whole lot of evolution sequence. Usually those things are played to an extreme, but it barely lasts a few seconds. I shouldn't be complaining about this, but there's a certain style to be maintained here. Also, I enjoy reading this!!! So thank you very much! As to why Gatomon and Patamon don't go in-training, I always figured it was because they're older and more experienced than the others, allowing them to maintain higher forms more easily. Kinda the same reason why Gatomon was able to maintain being Champion level all through season 1 while the other seven couldn't. Her training from Hell courtesy of Myotismon made her tougher than the others in terms of level reverting. And Patamon has been through enough to put him in the same boat. Just my guess on the subject. They couldn't have Tailmon go below her Adult stage! That would make the plot hole of her Holy Ring not coming back when she returns to Tailmon more obvious, which they try to avoid you noticing by never having Plotmon return to Tailmon on screen later. 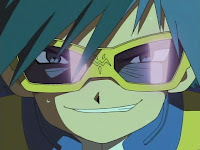 Bakemon are the mooks of the Digimon World. 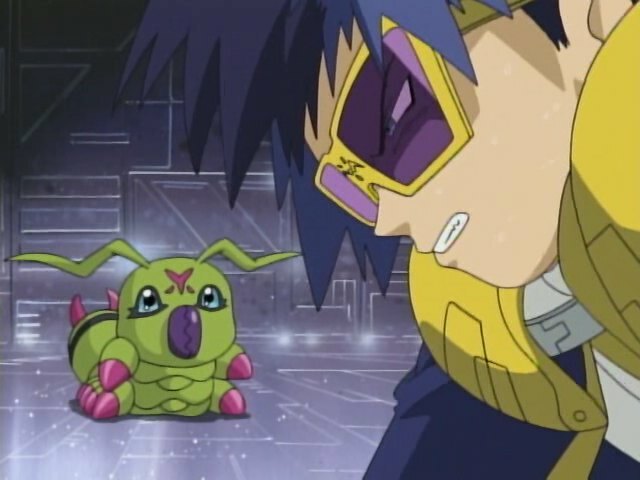 Remember, by the time Myotismon's first form went down, they were no longer even a match for the Rookies. Well, it seems in this episode and the last one, TK has tapped into the genetic awesomeness of Hiroaki Goddamn Ishida. I assume his own kids (and Matt's) will also have that awesomeness and pull off their own moments of bad assery.